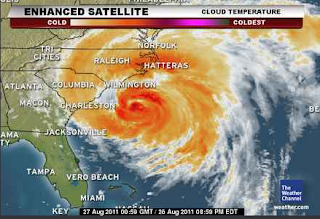 Hurricane Irene prepares to make landfall. As Hurricane Irene prepares to make landfall on the eastern seaboard, many residents are making the choice to stay or go. In either case, you need to prepare. This is how to prepare for a hurricane. If you are not in an area affected by the hurricane, but know people who are in the path, please tweet this to them or share this post. If you are in an area that has declared a MANDATORY EVACUATION, leave. Don't be a hero. If you are drastically wrong in your decision to stay, no one at your funeral will comment how brave you were for ignoring the warnings. To stay or go? Here are some things that you will need to do in either case. If your home is in an evacuation area or looks like it will be close to the high winds and rain, board up ALL of your windows and doors. If you only board up windows to the wind side, you risk the air pressure or swirling wind currents blasting out the windows on the other side of the home and literally blowing the roof off of the house because pressure built up inside the home. D-Cell Batteries - for flashlights. And any batteries that may power a radio or television. Generator - The possibility exists that your could be without electricity for days or weeks. Having a generator can keep refrigeration or any medical equipment used by occupants of your home running. Don't worry about the TV or Internet. Cable and Internet will probably be disrupted. Water - Water service will probably be disrupted. You want to have at least a week's supply of water on hand for drinking and cooking. Food - Stock up on dry goods, items that need little or no preparation. Anticipate not having the ability to cook. If you use a camping stove to boil water or prepare canned goods, make sure you are in a well ventilated area. You won't be able to smell fumes from a camping stove, but they are there and they can be deadly. Toilet - Fill you bathtub full of water. If your water supply is interrupted, you will still need to use the toilet. When you use the toilet, scoop a bucket of water out of the tub and dump it in the bowl. You can flush the toilet. You can also use this water for washing hands. Transfer water to a sink and let everyone wash their hands before letting the water down the drain. Conservation of your water is critical. Lighting - Battery powered lights are best. However, if you use candles, take extreme care that they are not near fabrics or any other flammable materials. You don't want to survive a storm and then die in a house fire. First Aid Kit - You want to have First Aid materials handy. Put them in a plastic bag to keep them dry. Flying debris can cause cuts or abrasions. You want more than just a box of band-aids. Duct Tape and Plastic Wrap - You'll want to wrap any valuables - artwork, antique furniture, collectibles, electronic equipment, even clothing. Paper Products - Toilet paper and paper towels. Medications - If you are on medication, you want to have at least a two week supply on hand. Cash - If electricity is disrupted, ATM machines will not work. You want to have adequate cash on hand to carry you for a couple weeks. Also, credit card machines will not work. Have cash. DO NOT RIDE OUT THE STORM IN A BASEMENT - A basement can flood quickly. Stay in a first floor room, away from windows, preferably next to a load bearing wall. If you cannot get in an area free of windows, either board up the windows or stay behind large, low pieces of furniture, like a table. Do not seek shelter behind something tall, it could fall on you. Communications - Expect disruptions in the Internet and cell phone service. Even if cell phone service is not interrupted, too many calls will jam the transmitters. Text messaging puts a lower load on cell transmission. Keep your cell phones and wireless Internet devices in sealed plastic bags until you need to use them. If you have access to a CB radio, or a short wave radio, that can be helpful. A typical CB radio has a range of about five miles; short wave, much longer. After The Storm - Be very careful when leaving your home. Downed power lines and water do not make a good mix. Driving - Do not drive through water deeper than 12 inches. It only takes a foot of water to wash away a vehicle. Plus, you don't know what is or isn't under the water. The road may have been washed away, and you could be driving into what looks like a puddle, but could actually be a large sink hole. Most of the items listed above should be brought with you - medications, first aid, cell phones, water, food, etc. Documents - put in a watertight container or bag important documents - auto title, insurance policies, children's shot records, anything related to or necessary for the health of the members of your family. Toilet Paper - You don't know how long you may be stuck in traffic and if you run out of gas, you cannot ignore nature's call. Contact Lens Solutions and Glasses - Eventually, you'll want to take out your contact lenses. Or if you need to use reading glasses, you will need them. Take extra pairs if you have them. Maps - Unless you have a specific destination, like a relative, you may be heading into uncharted waters. Having a map, so you can pick a target will come in handy. Also, anticipate hotels filling up, the closer you are to the affected area. You may have to drive to the next town. Your best bet is to head to large metropolitan areas. They will have the greatest number of hotels. Food - Stock up on food that requires little or no preparation. I used to live on the road as a comic and I got through a lot of miles with Peanut Butter and Jelly, a small cooler with some lunch meat and a loaf of bread. Small Children - This can be a very scary time for small children. Make sure you pack their favorite toy, blanket, keepsake. Also pack activities - crayons, paper, coloring books, books to read, handheld games (don't forget batteries). Children can be very resilient when they are occupied. If you have a portable or easily transported DVD player, pack that and some of your children's favorite movies. The comforts of home will help ease any anxiety they may be experiencing. Also - keep calm. Your fear will only translate to the children. If you remain calm, no matter what happens, you'll greatly lessen the load on their little minds. Medical Issues - Members of your family may be on dialysis or require other regular medical treatment. Call ahead to a hospital in your target destination and see if they can accommodate you. Cell Phone Chargers - Make sure you bring all of the chargers you have for cell phones and electronic devices - car and indoor chargers. Laptops, iPads, Tablets - Even though Internet service will probably be interrupted at your home, where you are headed will have Internet access. Most hotels have Internet access. If for some reason they don't - go to a Denny's (open 24 hours), McDonald's or Wendy's. All of them have instated nationwide free WiFi programs. Burger King has not. Or seek a local coffee shop. Starbucks has a network, but I think it is only available to customers of a certain carrier - AT&T or Verizon. Backup Your Computer - Computers that are too large to take should be backed up to disc or to the web. If your home is severely damaged, the computer could become a casualty. You don't want to lose any data. Digital Cameras/Camcorders - You'll want to be able to take photos of anything that happens along the way. Plus, when you return, you'll want to document with photos or video any damage done to your property. Plus, you can get some great pictures of the kids. Keepsakes - This is a tough decision. If you have your grandmother's wedding ring or some other item that is completely irreplaceable, make room for it. Put all items in one bag, so you know where they are. You won't be able to take all of your scrapbooks and all the kids pictures from pre-school on - like I said, it's decision time. What can you reasonably take in your car. Blankets and Pillows - Depending on how traffic is, you may spend an extended period of time in the car or be forced to stop somewhere. Having blankets and pillows can take the bite out of sleeping in a car. Clothing - Face it, you can't take you entire wardrobe. However, at least three to five days worth of clothing should keep you going. Don't forget jackets or sweaters. It may be cool wherever you are headed, and you don't want to be forced to spend any more money than you have to. Cash - On higher ground, you should be able to use your credit or debit cards, but just in case, having an ample supply of cash available will come in handy. If you bank at a small, local bank, this is even more important. You may drive outside of their network of ATM's or branches. Have cash. Something For Yourself - Taking care of everyone else is your first priority, however, you will need to take care of yourself. Take a favorite book, magazines, a DVD for yourself or your favorite music. Contact Relatives or Friends - Call relatives or friends and let them know where you are going. God forbid something happens on the trip to safety, but you want people to know where you are headed. Then contact them once you arrive. Pets - If you have a dog or a cat, it is best if you can use a pet carrier for them in a packed car. If you have a lot of other animals - birds, snakes, fish - you may have to make a decision, unless transporting them is not a problem. Photograph Everything - Before you leave, take pictures of everything in the house and yard - furniture, artwork, electronics, pool tables, exercise equipment, appliances, you name it. If your home is damaged, this will help with insurance adjusters. If you have time, serial numbers of electronic equipment and appliances can be helpful, but are not a must. Put All Outdoor Furniture Inside - Umbrellas, lawn chairs, toys, tables become lethal projectiles in high winds. Put them in the house or garage. Hopefully, these tips will help you make the best of a challenging situation. Always remain calm. Act smart, and realize that you're not alone. This is a time to really practice patience and deep breathing. If you act properly and prepare, you should be able to weather any storm. If you have friends, please pass on my guide on how to prepare for a hurricane. I hope Hurricane Irene is milder than what is being predicted.